It’s fairly easy to find vintage letter images but it’s not that often that I find an illustration of someone writing a letter. With the deluge of Facebook posts, Tweets and texts; perhaps letter writing with pen and paper is somewhat out of fashion. And yet, most anyone will tell you that they treasure those hand-written missives that they do receive. All good parties have a definite beginning – the sending of invitations. 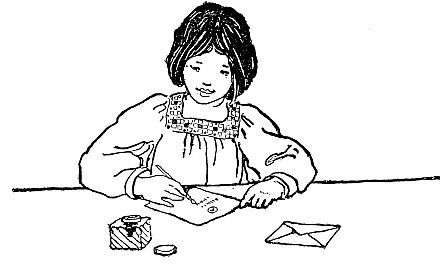 The little girl in this drawing is putting her ink well and quill pen to good use in writing an invitation to her friends to come to her party. The envelope lays nearby at the ready for addressing. Fortunately, for us who use these vintage images to create new pieces, the drawing shows no signs of what the girl is writing about. That opens up this drawing to all sorts of interpretations and makes it quite a versatile drawing.